Samar Study hall is situated on the lush green plains on the out skirts of Kashipur. It is one of the most upcoming & developing areas of the town. The school is in a clean and quiet area about 500 yards from the main road. The school with a difference - signifies its Punch line, that all the classes from Nursery to XI have facilities of Interactive Boards, Computers, Speakers, Projectors operated by remote control. We believe the teaching should be enjoyable by the students and teachers as well. 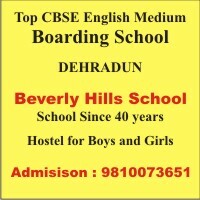 The school has highly reputed Principal and well qualified & experienced staff. The staff focuses on the various developmental needs of the students in order to deliver their full potential. Modern teaching techniques and support tools are being used to assist in the learning process. Above all we want to deliver the best value to our parents. Excellent standard of education is being provided to the students.